If you are worried about allopurinol and alcohol, this article will explain the key points. You will learn that, generally, alcohol has little effect on allopurinol. However, like all aspects of gout management, each gout patient must be assessed individually. After you have read about allopurinol and alcohol, if you still have concerns, you can discuss your personal opinions and experiences in the gout forums. I’ve put links to the gout forums and other gout support resources at the end of this article. Please use the forums to discuss how alcohol affects your allopurinol treatment. Together, we can make sure that you get the right treatment to suit your needs. Allopurinol and alcohol is a popular topic for debate among gout sufferers. Allopurinol is the leading medicine to lower uric acid, and gout patients who take it, at the right dose, are almost certain to take control of their gout. Yet, they remain concerned that alcohol consumption might affect allopurinol and reduce their chances of recovery. In this article, I consider evidence relating to alcohol consumption and allopurinol. When taking allopurinol, keep your alcohol intake to a minimum i.e. 1-2 standard drinks, once or twice a week. Drinking more than 4 standard drinks on one occasion, even if infrequently, is strongly discouraged. In a letter to the British Medical Journal in 1988, Ralston and colleagues summarized their investigation into alcohol and allopurinol treatments. Excessive consumption of alcohol has long been associated with gout in susceptible people. Although patients with gout are generally advised to stop drinking alcohol or cut down their intake, this advice may not always be followed. We looked at the relationship between alcohol intake and the response to treatment of gout. They considered alcohol intake of 30 units per week or more to indicate heavy drinking. They report that 95% of heavy drinkers usually continue to have gout attacks, compared with 29% of gout patients drinking less than 20 units per week. However, the quality of data is poor. They note that stated alcohol intake is probably not the same as actual intake – i.e. patients did not tell the whole truth about alcohol intake. Worse than that, there is no indication that allopurinol treatment was managed properly – i.e. target uric acid levels are not quoted, only ridiculous normal ranges. They point out that failure to take allopurinol is the most likely cause of treatment failure. How does alcohol affect allopurinol effectiveness? I can find no hard evidence to suggest that alcohol reduces the effectiveness of allopurinol. I have found evidence that alcohol can affect allopurinol. But I have not yet reviewed it in full. So if you would like to discuss this, join the Gout and Alcohol Information discussion. Clearly, if you drink so much that you cannot remember to take gout medications, then you have a serious problem that needs to be discussed with your doctor. 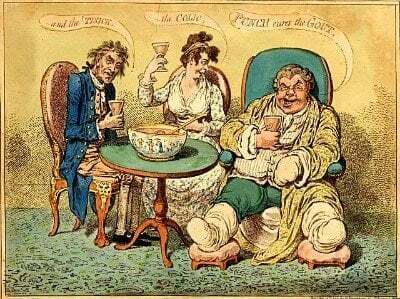 You have probably seen my frequent calls for “moderation in all things” for gout sufferers, and alcohol is no different. The biggest problem with allopurinol treatment continues to be inadequate dosage management. You must insist on frequent uric acid blood tests until you have achieved uric acid levels below 5mg/dL (0.30mmol/L), with allopurinol increased up to a maximum of 900mg per day. If you cannot achieve low enough uric acid levels, then factors such as alcohol intake must be considered. You must ensure that your allopurinol dose is managed properly and that you are taking the correct amount to control uric acid levels. Once your uric acid levels are stabilized, you can check if alcohol affects you by comparing results during periods of abstinence against results during periods of normal alcohol intake. If you are still concerned about alcohol, you should read my gout and alcohol guidelines. Leave Allopurinol And Alcohol to browse Allopurinol And Other Issues. Kaneko K., Fujimori S., Akaoka I. (1991) Changes Caused by Ethanol Intake on Metabolism of Hypouricemic Agents (Combination of Allopurinol and Benzbromarone). In: Harkness R.A., Elion G.B., Zöllner N. (eds) Purine and Pyrimidine Metabolism in Man VII. Advances in Experimental Medicine and Biology, vol 309A. Springer, Boston, MA. 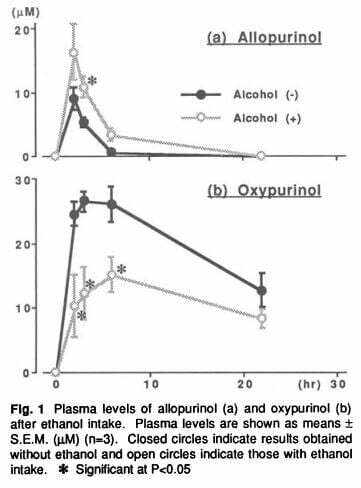 Effect of Alcohol on Allopurinol PDF.